I’ve been thinking a lot lately about just how far I’ve come as a DIYer in the last six or seven years. I have to admit, seven years ago, I never thought I’d be where I am today. People ask me on a fairly regular basis how I learned to DIY. I always tell them that I’m pretty much self-taught, but it has been a slow and steady progression for me. I didn’t start out knocking down walls. Not many of us decide that for our very first DIY project ever, we’re going to cut the roof off of our house and add a second floor. Okay, well…my dad did that when I was a baby. He had never even so much as built a birdhouse or a doghouse before, but after reading a series of Time Life books on “how to build a house” that he checked out from the library, he was convinced that he could do it. So he did it. But most of us don’t jump in with both feet like that. For most of us, we start somewhere small, and then gradually build upon that knowledge. And on my journey, I’ve also had to tackle quite a bit of fear. Fear of the unknown is a powerful force that can keep us from accomplishing our goals. Facing that fear is empowering. I was trying to remember some of my very first real DIY projects in the condo, beyond painting and such. The one that sticks out in my mind the most is tiling the backsplash in the kitchen. That was my first time ever tiling, and I was very nervous. But I had watched some videos and it didn’t look difficult, so I was pretty confident I could do it. I bought myself a tile saw — the cheapest wet saw they had at Home Depot at the time — and got to work. It wasn’t perfect, but it was a learning experience. And on the whole, I was very proud of how it turned out. And so much more. But all of that was a progression. I certainly didn’t walk in to that condo right after we bought it and think that I would be installing walls of built-ins. It took time for me to get there, not only with dreaming up the bigger and bigger projects and goals, but with my knowledge of how to get them done. And while that was all good, and that skill and knowledge certainly has helped me a great deal in this house, the house brought with it a whole different set of challenges for me. 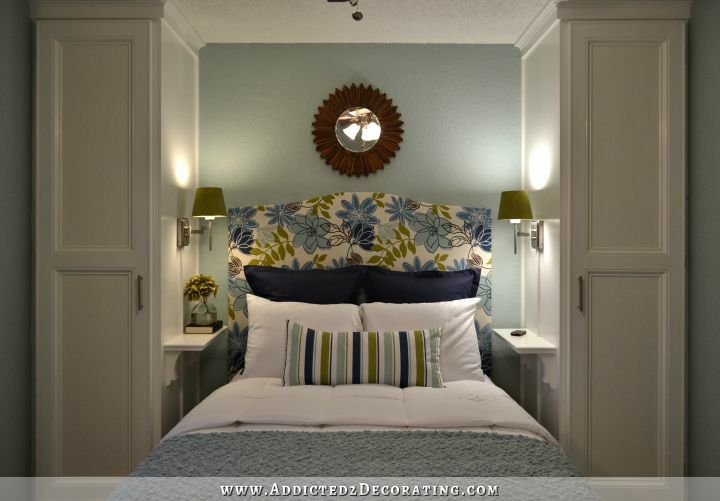 The condo was mostly about surface finishes and a few building projects. The house…well…it has brought a whole heck of a lot more. And it has required me to face my fears much more than the condo ever did. Do y’all remember when my kitchen looked like this? The drywall on the ceiling was literally crumbling in places, and that wall…well…that was was in sad shape. But I tried my hardest to salvage that drywall. “It’s bad for landfills,” I would tell myself, “so I need to salvage as much as I can.” No, the reason I tried to salvage it is because the idea of ripping down that drywall and exposing whatever was behind it scared the crap out of me. I can’t really explain it. It was just one of those irrational fears, but it was a very real, very powerful fear for me. It was the fear of the unknown. Is that drywall holding back all of the cockroackes, black windows, and brown recluses? 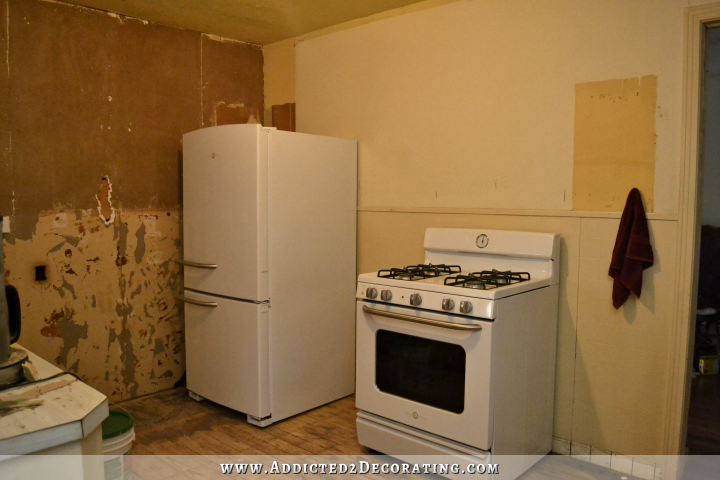 If I tear that drywall down, are they all going to pour into my kitchen? And is that drywall on the ceiling shielding us from all of the rats and rabid squirrels in the attic? I mean, I was literally scared to take it down. But it became evident that trying to salvage that brittle old drywall was a ridiculous idea, so it came down. And I survived. Of course, it helped that my sister and brother-in-law were here at the time helping me. Facing those big, scary challenges is always a bit easier with someone else by your side. But one time didn’t really make all of the fear and dread go away. I had that same sinking feeling in my stomach when it came to the ceilings in the bathroom, and the dining room, and the music room. Thankfully my father-in-law was here for when the ceilings in the music room and dining room came down, so it didn’t feel as scary and daunting. And it helped me get used to having the attic exposed for a while. And once again, I survived. No rats or rabid squirrels in sight. And all of that has worked together to help me gain the experience and the knowledge I needed to tackle those things on my own. 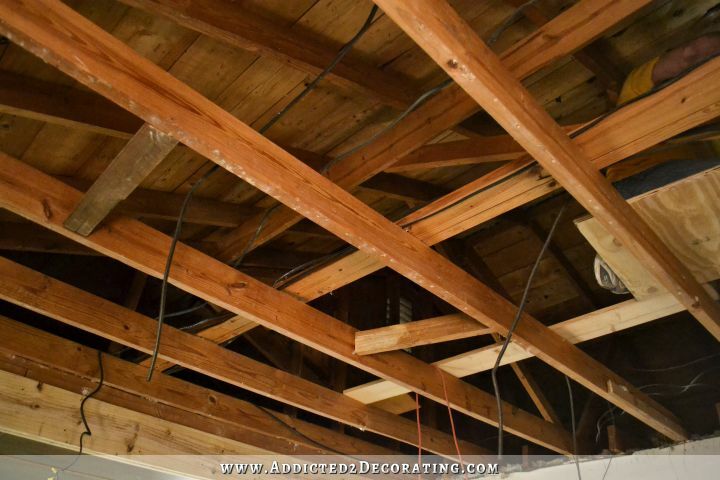 When it came time to tear down the drywall (or plywood, as the case was) from the breakfast room and pantry ceiling, I did it by myself. It wasn’t a pleasant task by any means, but I wasn’t afraid of it anymore. This house has also presented new challenges in that I’ve had to learn quite a bit about construction. In the condo, dealing with surface treatments and built-ins, I never had to know what a load-bearing header was. If you had asked me four years ago what a king stud and a jack stud are, I probably would have guessed they were terms used by horse breeders. But in order to turn this old house into what I envision, I had to learn that stuff. 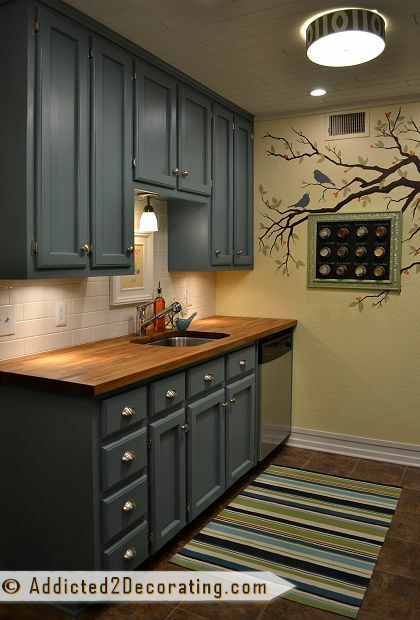 Surface treatments and built-ins wouldn’t cut it any longer. 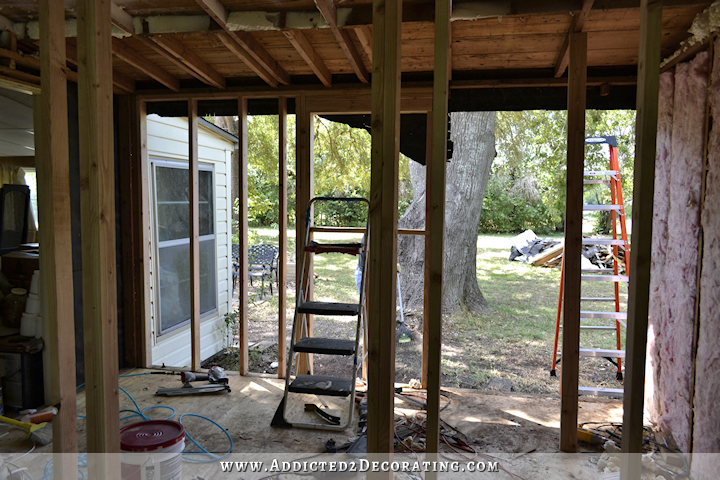 I had to learn to change the structure, remove load-bearing walls, create new openings, etc. I’m not gonna lie, the very first one was scary. But again, I had someone with me, which made it easier. That time my brother came over to help, and we got the wall in the kitchen removed and created the opening where the peninsula is now. But we didn’t just muddle through that project. When it comes to something as serious as opening up a wall, research is a must. You have to understand exactly what you’re doing and why you’re doing it. So I did a ton of reading, watched as many videos by pros as I could find (e.g., This Old House and the like on YouTube), and even had a licensed contractor come over and give me some pointers. That first one was scary, but getting it done was so empowering. 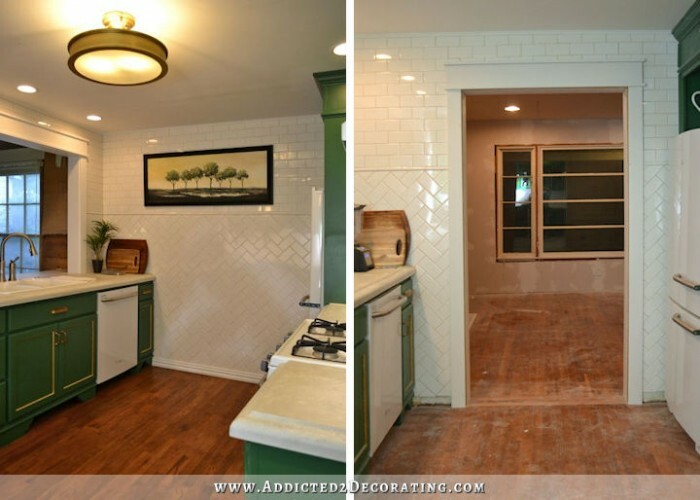 So much so that when I decided to do another one and put an opening between the kitchen and the dining room, I felt confident, and I think I even did it on my own. Matt’s dad was here at the time, but I’m pretty sure he was working on other projects while I was doing this. You can do it. Maybe not now, or even next week. For now, you might just need to pick up a circular saw and practice using it. Get used to the feel in your hand, and what it feels like to rip through a piece of plywood with it. You might need to pick up a framing nail gun and get over the initial fear of the immense power that it has. 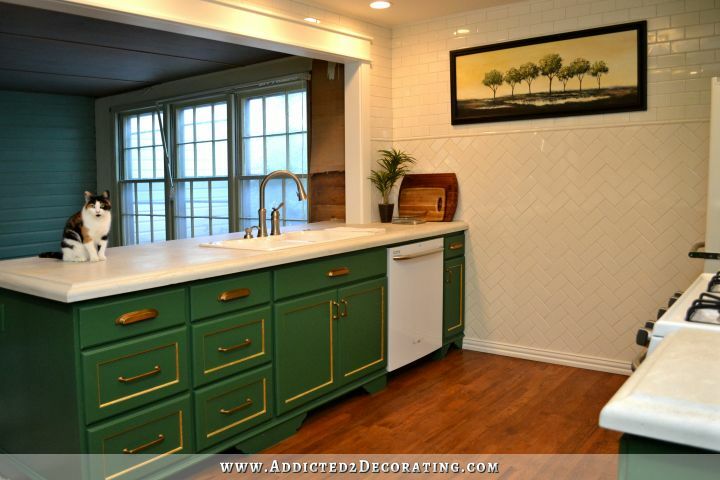 Or maybe you could start like I did with a relatively easy project like tiling your kitchen backsplash. You don’t have to jump in with both feet like my dad did and cut the roof off of your house. 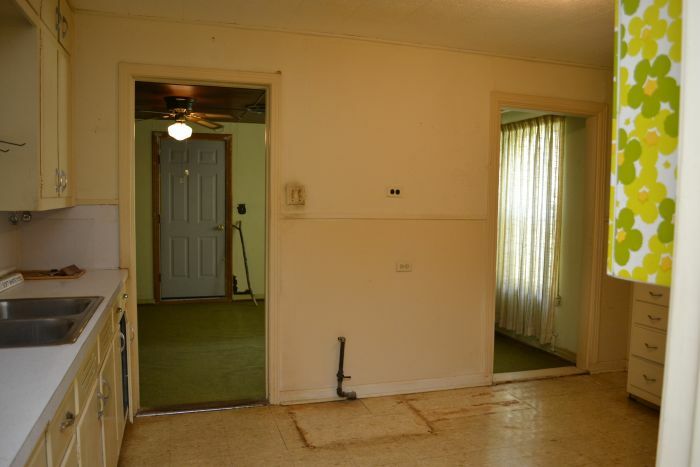 Heck, you don’t even have to start with ripping down drywall and cutting openings in load-bearing walls (or non-load-bearing walls, for that matter). But just start somewhere. Start with something easy. As you work, you’ll learn, just as I have, that there’s a negative correlation between fear and knowledge. As your knowledge increases, your fear will decrease. And let me tell you, ladies, there are few things more empowering than knowing you have the knowledge and skill to transform an old house into exactly what you want with your know-how, your tools, and your own two hands. But that journey may start with tiling your backsplash. So go. Do. And don’t let fear hold you back. Thank you for this post, so timely! 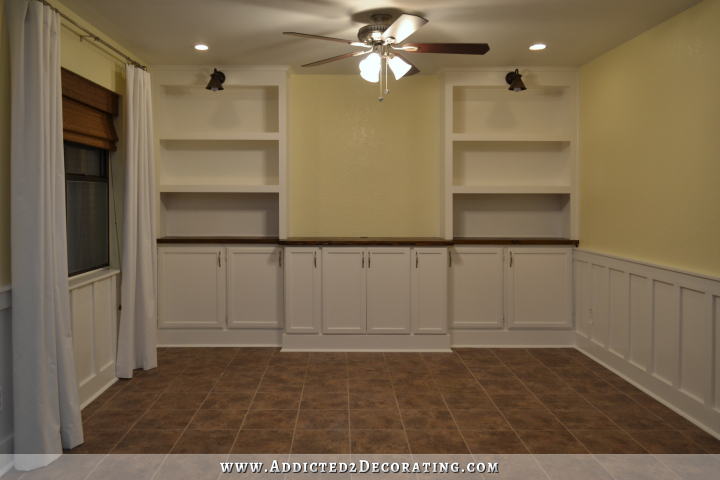 While I am not (usually) fearful of the larger projects (like you I research until my eyeballs fall out) I was completely terrified to caulk the trim I just installed – I had never done it and for some reason that simple task had me shaking. I ignored the tube for three weeks until I couldn’t take it any longer . . . and with a little “whats the worst that could happen?” running over and over in my head I grabbed the tube, cut the tip and started. Guess what? I loved it; it was fun and turned out great. You are a mighty girl! Love this! I have so many half finished projects around the house and I need some encouragement and a swift kick, too! It always feels good to complete a project no matter how big or small it is. Thank you for being an inspiration to me and to so many others. Great inspiring post! Thank you! I just want to start with a board and battan treatment in my hall. I’m gonna get started! 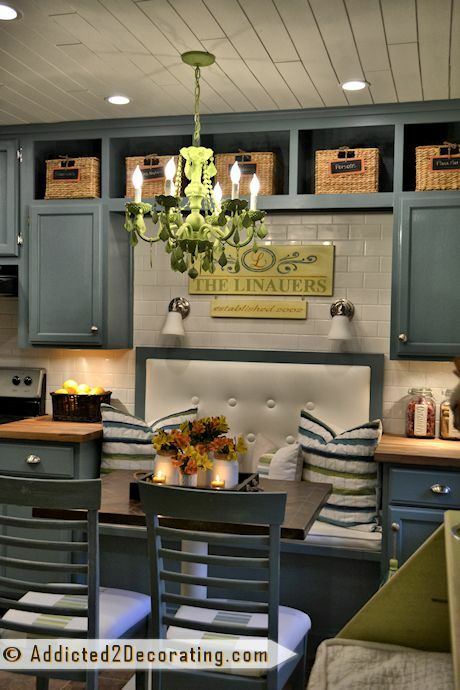 Then maybe I’ll do th backsplash in the kitchen! And loved your post about your dad. Don’t know how I missed it before. So wonderful! I just read the story about your dad adding a second story to your childhood house……that brought back such good memories of my dad………he would have been up there pounding away with your dad! And, using all OSHA approved methods! Thank you, thank you, thank you for sharing this. It brought back so many good memories (and maybe a few not so great ones, too)! Wow! Just read the post about your Dad whose motto must have been “Just do it”. I swear there must be a DIY “gene”. Unfortunately, many people who might be capable are talked out of trying by people who just can’t imagine doing it themselves. I am SO enjoying your blog and look forward to each new adventure. I bookmarked this page for inspiration. Woohoo! Preach it, Kristi! I’ll be 59 in a few weeks and started DIY before the Internet! You’re absolutely right about starting small. I’ve learned so much just by taking the next step. Your story about tiling the backsplash in the condo reminded me of the first one I did, with my previous husband, I think around 1988. We didn’t know any better (remember, no internet), so we used an electric jigsaw with a fine blade to cut the tiles. Burned the poor thing out just about the time we finished. Thanks to you, Kristi, I’ve tiled a floor, turned a closet into a drop zone, hung a wall of shelves around my TV to be a focal point wall and just rewired my chandelier so it could hang over my table instead of on the side. Your journey inspires many and gives us confidence to dig in and try things. I’m 60 something and love DIY. My friends don’t get it, but I say why pay someone for something you can do yourself? You will most likely do a better job anyway because it’s your house. And from the standpoint of building confidence, you can’t beat it. I get much more enjoyment looking at the projects I’ve done in my house than I would if someone else had done them for me. You are doing a great job “rebuilding” your home and will enjoy many years there. Keep inspiring us! Thank you!!! Great post! But I also REALLY love the link to the 2013 post about how your dad learned to build an addition! The old family photos brought a smile to my face and the process was a fascinating read. Kristie – thank you. Beautifully written and no truer words spoken. I’ll take those words to heart to start a project I have in my mind. This is so encouraging. We are just getting our feet wet with this whole home ownership thing and we are not courageous enough or well-endowed enough piggy-bank-wise to take on the big real project I’m drawing of: removing a wall (that has plumbing in it) and turning our closed off kitchen into an open one with an island. So we’re doing little projects while we wait, like moving the laundry appliances and drawing on subway tiles in the kitchen with Sharpie. Seriously. We’ll get there one day. thank you so much for being honest about your experiences! Wow! Big project to tackle and thanks for sharing. I thought that you had been doing this kind of stuff for years. Apparently you have a knack for technical know how, and you have family members who are knowledgeable and willing to help. You are too cool for words! Congratulations on a great inspirational post and on all your fabulous accomplishments. I want to tile a small back splash in my laundry room, I am hesitant only because I am completely inept at measuring. I am thinking of maybe doing a practice back splash on a board or something. Has anyone ever tried this? Maybe just buy some really cheap subway tiles and practice on a board before I commit to the wall? Yes, measure twice and cut once. Take a deep breath and dive in. I think I actually saw a you tube video once on how to read and use a tape measure! REALLY! I swear, you can find ANYTHING, almost, on there! I live alone and I bought the cutest little lakefront cottage last year. I never understood what vinyl siding was until I moved here and realized my little house is covered in it. I pulled up a section and realized the original siding was intact. I told my neighbor I was going to remove it and restore the original. He looked at me like I was crazy, shuddered at thought of all the money the previous owner paid for to have it done. I realized then that DIY’ers tend to be brave souls as well as out of the box thinkers. I now keep my plans to myself, learned that nobody but myself is brave enough to visualize and desire the changes, to ask the how and the why’s. A great post. We all have to take baby steps, crawl before we walk, etc. with anything we do in life. We weren’t born knowing how to read, write, feed ourselves, drive a car, but we learned! I am 60 yrs. old now, and when my husband and I got married and decided to buy a brand new house ( have it built ) we knew nothing. Had never owned a house, never built a thing, didn’t even know how the things in our house worked or how to maintain them. But with books, videos, advice from friends, neighbors and the knowledgeable people at the hardware store, both of us learned together. More out of need, because we had no money to pay a professional, but also because we felt it better to know than to rely on someone else that may or may not know what they were doing. This doubt stemmed from the plumber who did our house…he had hooked up the hot water line to our toilet, and my brother came out of there on move in day asking why steam came up when he used the toilet!!! Luckily, the plumber lived down the street and came right away to fix it, and it was just due to him trying to hurry thru the job. But it made us wonder if we could trust anyone to do a good job. Would we even know if they did it correctly? So even if you never plan to knock down a wall or whatever, it’s good to know a few things about almost everything. Never stop learning! At least learn where to shut off water and power to your home, in case you ever need to do it! Right! I replaced several outlets in my home this summer, and I feel incredible about it! Funnily enough, tiling my backsplash is one of three major things left to do to finish our kitchen. Also funnily, tiling is scaring me a lot more than lots of the other things we’ve done, like tearing down walls, drywalling and mudding, blocking in a door, putting beadboard panelling on the ceiling, doing some major re-wiring, and moving staircases. I am absolutely terrified of the last three things we have left: installing our hardwood countertops using a herringbone pattern, tiling the backsplash, and hanging the cupboard doors. Those things are so VISIBLE, so if we screw them up somehow, everyone will be able to see the mistakes, and I’ll have to LIVE with the mistakes. I’m already seeing spots on my cupboard painting job that didn’t turn out that great and questioning whether we made the right choices with kitchen set up, and whether I can actually live with the slightly crazy apple green colour I painted everything. So yeah, give me the “hard” stuff any day, it’s the finishing bits that scare me, lol! You are amazing! I look forward to the inspiration you bring me every week! I am always in complete awe of what you accomplish! Fierce! I’m dreading trimming out my builder-grade kitchen cabinets (adding molding edge trim, new toe kick with feet, end panels, closing the gap to the ceiling, and crown molding) before painting them. I don’t have experience with angle cutting and our table saw is not the best. Worrying it will come out crappy or I’ll waste too much wood is freaking me out and I’m usually a go-for-broke type. I normally would want to call a carpenter but I’m trying to keep the kitchen remodel budget down. 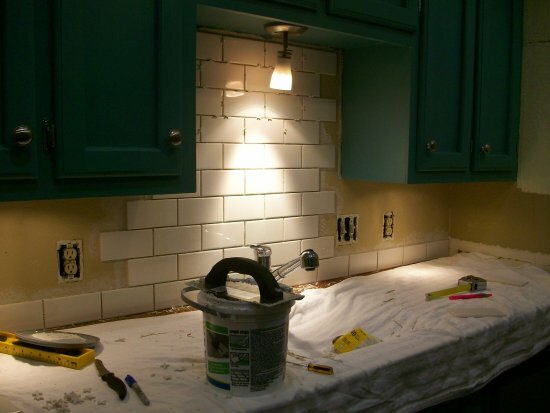 I do know I don’t have the patience/time for tiling with a full-time job though so when it’s time to redo the counter and backsplash, professionals will be called. So I keep saying to myself…WWKD–what would Kristi do? to build my confidence to tackle this project. YES! Girl, you and I are cut from the same cloth, right down to the father who cut the roof off his house to add a second story as his first DIY project! I struggle with the same fear of new projects, but once I take that first step (or cut) it all just starts rolling and has never been as scary as I thought. This is a great post for everyone to read. I’ll be sharing it for sure. I just bought 4×8 underlayment to put on my bedroom wall with the brad nailer thingy part so it will look like shiplap. I can’t wait to do that and the living room wall. Now all that is going to teach me now to do angles, oh boy. I tried to find an angle finder but neither Home Depot or Lowes had one that I could understand (that, I guess, comes with age, though in my case, maybe not?!!) Guess I’ll just try to use a template of aluminum foil, lol. So, I’m using my little sander and doing the edges of the cuts, then to prime and paint and then to hang. We will see how all this turns out! I can use a saw now, too! – bought the small set, Black & Decker, 18 vt so I can handle both the little saw and the screwdriver/drill. I was so scared of saws, but I’ve learned to clamp a straight edge to what I’m cutting and I’m getting good at straight cuts too! This is such fun and you are such an fine example of someone who just DOES it. So I’m trying it too! Thank you for your encouragement and thank you for all your instructions and daring-do. It changes lives! It did mine. What a new adventure for this sissy 73-year old! You are one amazing woman! 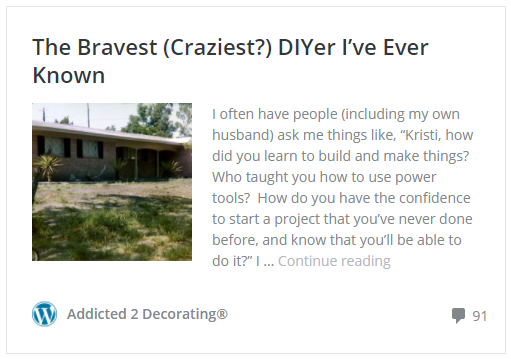 Kristi your blog is already one of the Top Sites on my Mac but this particular post I am just going to keep in an open window for a Long Long Time and also of course bookmark. You just become more meaningful, eloquent, and smart all the time!